Actress Tara Sands narrates this third adventure in the series by Wendelin Van Draanen. This time Sammy is serving detention at St. Mary's church where she find herself a suspect when Fr. Mayhew's gold cross is stolen from the safe. Intertwined around this main event are equally riveting ones: Sammy's relentless curiosity about Holly, who she notices while working at the Homeless Shelter; the junior high school rivalry between Sammy and Heather that escalates during baseball season; and the flamboyant manners of the Sisters of Mercy who descend upon St. Mary's. Sands retains the voices, evoking a continuity of images for the more familiar characters. Listeners can almost touch the soft, gray hair of Grams, with her gentle and caring voice, while Officer Borsch's gruff and gravely one epitomizes the image of an overweight, street-smart cop. Adding to her repertoire of voices, Sands stretches her abilities with more subtlety. Meeting the homeless girl Holly, Sands is able to give her a feral-like quality, yet inflict a vulnerability that tugs on listeners' heartstrings. With the Sisters of Mercy, she offers just the right amount of lightness in tone, and her renditions of their singing will make listeners laugh out loud. 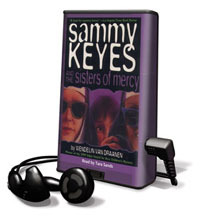 Sands' voice personifies the Sammy Keyes character, with all its adolescent love, anger, and humor. Listeners who love baseball will delight in this novel, as the playoffs for the championship highlight this story. Mystery fans will enjoy this 1999 Edgar Award winner for Best Children's Mystery.